For all your Pumping & Process Requirements - Pumps, Tanks, Vessels, Pipe Work etc.. 1/2 DELLMECO AIR DIAPHRAGM PUMP. CAST ALUMINIUM BODY - PTFE, EPDM or Nitrile SEALS - ATEX. CAST Aluminium ATEX Certified with Nitrile diaphragm, valves & seals. Cast Aluminium ATEX Certified with EPDM diaphragm, valves & seals. Cast Aluminium ATEX Certified with PTFE diaphragm, valves & seals. 1/2 Dellmeco air driven double diaphragm pumps, model DM15/25 (Atex Compliant) with Cast Aluminium bodies. Pumps to be supplied with either Nitrile rubber, EPDM rubber diaphragms or solvent resistant PTFE diaphragms, valve balls & seals. Non-wetted black anti-static polyethylene centre body & internal PE air valve assembly (non-stall, no oil design). Connections 1/2 x 1/2 BSP female. Maximum free flow on water 25 litres/minute with Nitrile or EPDM diaphragms - 20 litres/minute with PTFE diaphragms. Ideal for chemical transfer, solvents, paint, ink, PVA coatings, diesel, Petrol, filter press, bund emptying, drum & IBC un-loading, plus many other applications. Pumps can also be supplied with filter regulators, trolley assemblies, pipe work installation, tanks/vessels, filters etc. All spare parts & services kits available ex-stock TF Pumps. Maximum capacity Nitrile & EPDM. 25 lpm (6.6 US Gpm). Temperature Limits Nitrile & EPDM. 20 lpm (5.28 US Gpm). 1.9kg (4.19 lbs). 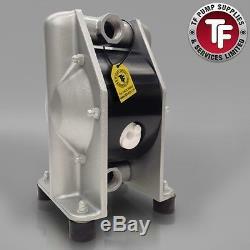 We also supply all other spare parts for all types of'Air Driven Double Diaphragm Pumps'. A VAT invoice shall be provided with every order. The item "1/2 Dellmeco Air Diaphragm PumpAluminium Body-Nitrile-EPDM-PTFE Balls & Seals" is in sale since Monday, June 6, 2016. This item is in the category "Business, Office & Industrial\Hydraulics, Pneumatics, Pumps & Plumbing\Pumps & Pump Accessories\Other Pumps".